Lads, dads, with the referendum just days away, we need to be talking about The Eighth. I’ve been wanting to add my voice to an already noisy debate, to back a YES vote, but I had my doubts. I don’t doubt that The Eighth Amendment is an archaic dictum, restricting intolerably the healthcare rights of women in Ireland. I never doubted that its repeal is the ONLY option. But I did not have faith that it was my place to say it. I doubted because I’m a man and I bet I’m not alone. The mantra ‘No uterus, no opinion’ haunted me. Mad, huh? A ridiculous notion. Why should the denial of rights to our fellow human be any less outrageous because of our biology? Why should our nation’s backwards disregard for its citizens’ health concern us less than they? Not a bit of it. Just because it doesn’t oppress you, it still affects you. We need to speak up. I say repeal. It IS our place, and our obligation to speak up. Not least because there are plenty of men on the NO side who will have no such doubts about their place. Those who are happy to keep the status quo, to keep women shackled to catholic dogma. Those men will afford you no such crises of confidence; no imposter syndrome for them. They will march and campaign, finger their rosaries and spew falsehoods. They’ll tear down posters and even pretend to be nurses! They’ll keep women in ‘their place’. They will say anything to keep the church’s rictus grip on the ovaries of women. I say repeal. The phenomenon of men not getting involved in this debate is well recognised by many wiser than I. And campaigns attempting to better engage men have, I hope, had some success. However, the one line that I hesitate to use is: “imagine if it were your daughter, your sister, or your mother.” While that may spark some into making a connection with the issue, surely we must think broader than: “Jaysus, yeah! What if affects ME? !” Well it already does. 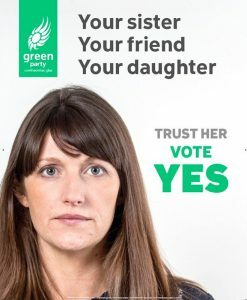 The Eighth Amendment restricts the rights of ALL women in Ireland to choose for themselves. It denies more than half this island’s population bodily autonomy. You see, the easy line for me, on a parenting blog, is to say: “I’m doing it for my daughter.” But I need to do it for so many more than her. I say repeal. Just so you know, I have previous. It doesn’t seem so long ago, and it’s more relevant now than ever that we mention the case of Savita Halappanavar. She died because of the Eighth Amendment; the state precluded her from receiving the treatment that would have saved her life. I was in newspapers back then, a tabloid Night Editor. * And maybe on that occasion I did what journalism ought to do – ask the right questions. I wrote and championed the page one headline that day in November 2012. It decried successive governments’ failure to act on the issue. 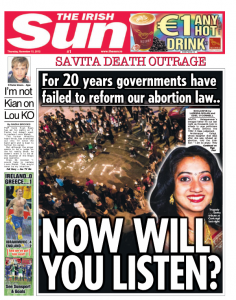 “Now will you listen?” it read, over a picture of a vigil for Savita. Well maybe at last they’re listening. So it’s time to speak; I say repeal. I say repeal. And I’ll also say that a failure to vote is as good as a NO vote. The onus is upon us, not just as men or as fathers, brothers, and sons, but as invested parts our nation’s present and future. We must speak up, and we must turn up too. *You can say what you like about that, I may even agree. Previous Post Guest Post: Meeting the challenges of single parenting.